Pi Day has begun … and this is like a Blondie in pie form. In a large bowl, mix together eggs, sugar, flour, and vanilla until well combined. Stir in melted butter, chocolate chips, and pecans. Pour mixture into crust. Bake 35 – 40 minutes until pie has lightly browned and set in the center. Cool completely before serving. I make my own graham cracker crust. It’s a little rustic, but it is tasty. 1 1/2 cups graham cracker crumbs – I buy the box of crumbs, much easier the counting panels of graham crackers, etc. Honestly, no one ever seems to count them the same way. Mix together and press into 9 inch pie pan sprayed just slightly with baking spray. Bake in the 325 degree oven for about 8 minutes rotating half way through. 9 January 2018 – Start making pies early since you never know what will be happening in mid-March – I mean, Mardi Gras occasionally, St. Patrick’s Day for sure, or just crappy cold weather that is killing everything in the garden that you planted – with ever present optimism – only to be spoiled be that late chill. Sigh. 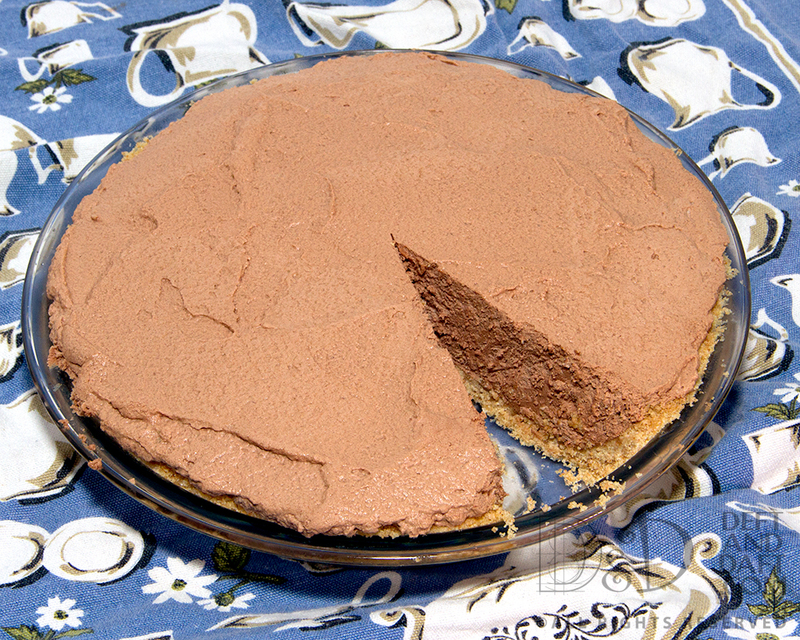 Very chocolate-chippy kind of pie. Crunchy on the top and gooey in the middle – in the best sense. Big success as I passed around wedges to people to get opinions. Might be even more lovely with some whipped cream – but it should not be sweet – the pie is certainly sweet enough. Not embarrassing, to say the least – in the butter use department. And I have to say that butter pie crust was so amazingly good. Now I am feeling slightly guilty about knowing the source for it. Will dig through lots of papers to figure it out.